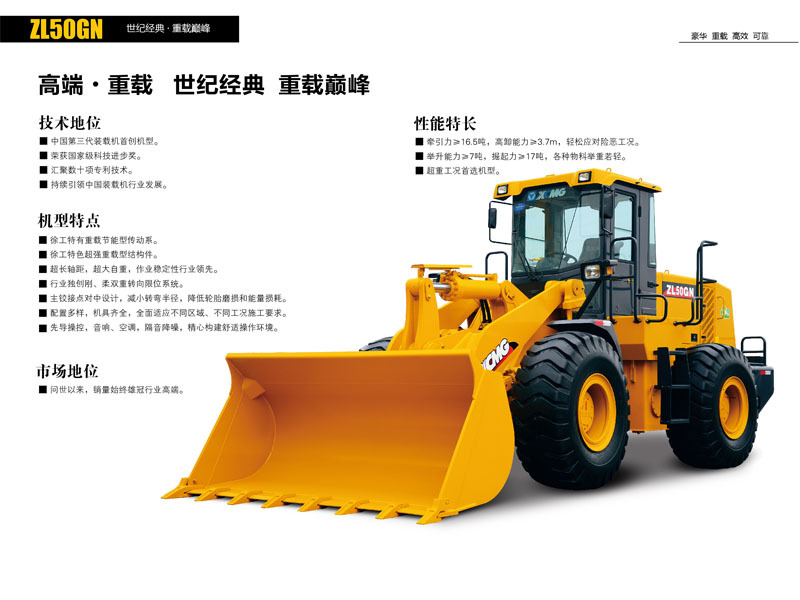 XCMG ZL50GN front end wheel loader Fully hydraulic powered steering with flow-amplified system. 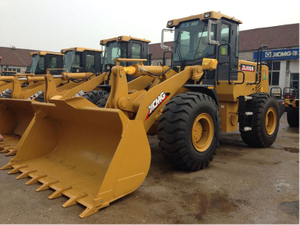 Pilot operated control for loader hydraulic system, power shift transmission makes convenient and flexible operating. XCMG new Z-bar linkage, high breakout force, shorter hydraulic cycle time, automatic leveling on any position, and greater productivity. Special quadrate type transmission shaft of construction machinery. Power transmission is more reliability. EG-TM combination is supported on three points by dual directions, vibration-isolators. Reducing resonance and fatigue failure of structure. Optimized structure of diesel engine air intake system reduces dust into air filter. Prolonging the durability of engine, convenience the service of air filter element. Integral openable hood, made by compound material, reduces noise and vibration, makes convenient and flexible operation and service. Equipped with SHANGHAI STYRE,CAT or CUMMINS diesel engine, electric starting, electric stopping, having excellent performance and reliability. 1. ZL50G wheel loader features fully hydraulic poered steering with flow-amplified system, Pilot operated control for loader hydraulic system, power shift and electric shift optional transmission makes convenient and flexible operating. 2. XCMG wheel loader new Z-bar linkage, high breakout force,short hydraulic cycle time,automatic leveling on any position,and higher prductivity. 3. Special quadrat type transmission shaft of construction machinery. Power transmission is more reliable for heavy equipment. 4. 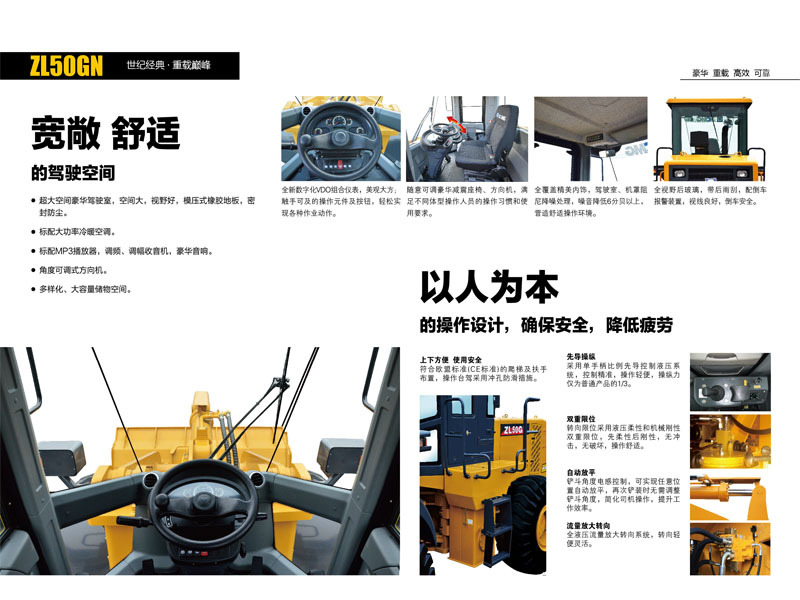 Integral new luxury cab, excellent visibility, safty and reliability for wheel loader. 5. EG-TM combination is supported on three points by dual directions, vibration-isolators. Reducing resonance and fatigue failure of structure. 6. Optimized structure of diesel engine air intake system reduces dust into air filter, Prolonging the durability of the engine and conveniencing the service of air filter element. Optimized cooling system drops overall heat balance temperature. 7. Integral openable hood made of compound material reduces noise and vibration,and makes operation and service more convenient and flexible. 8. 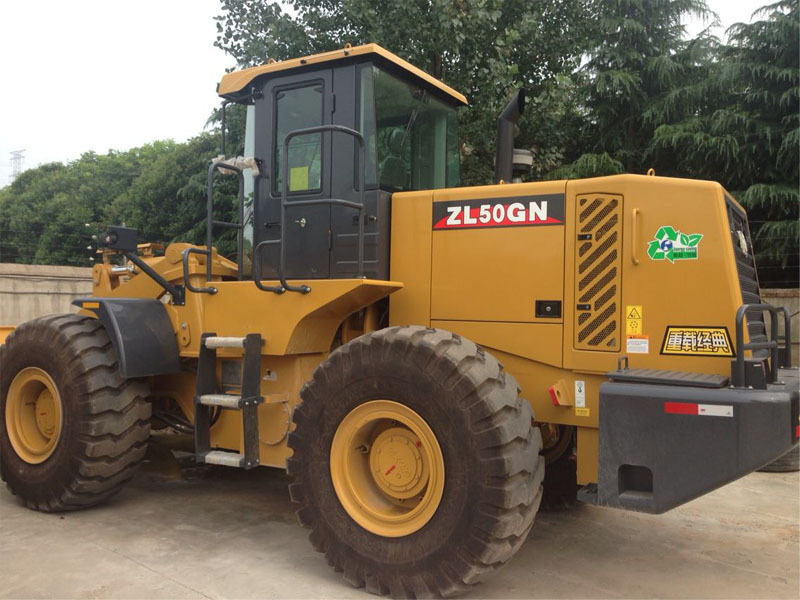 ZL50G wheel loader Equipped with SHANGHAI,STYRE,or CUMMINS diesel engine, which is of electric starting,electric stopping and excellent performance and reliability. 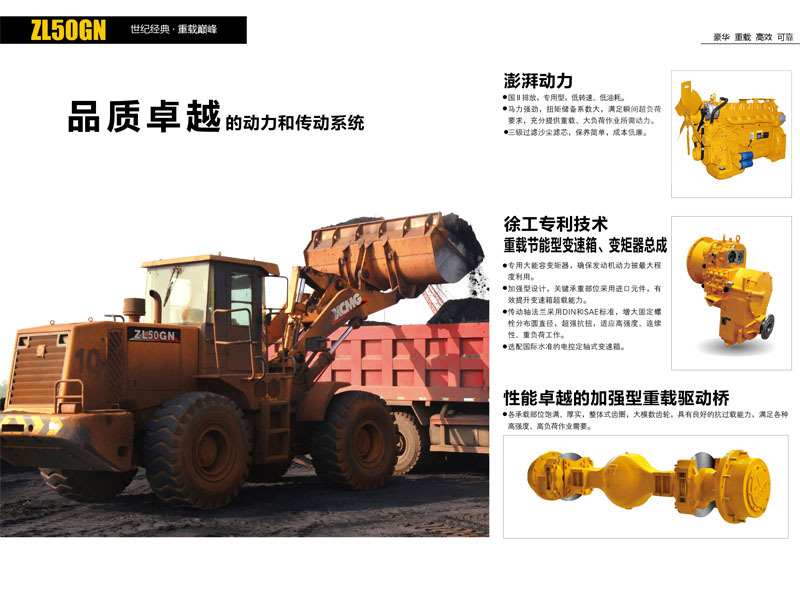 It approves to be one of the best wheel loader in China.